What's New for the 2018 Acura NSX? The 2018 Acura NSX retains all of the same award winning characteristics of the 2017 Road and Track's Performance Car of the Year. Its revolutionary hybrid engine, smooth styling, breathtaking lines and revolutionary performance continue to set the mark. There are two models of the NSX, however the NSX GT3 is for qualified buyers only and has a significantly higher price tag. 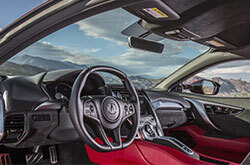 Few cars are as bold and revolutionary on the outside as they are on the inside. The commitment to perfection behind every aspect of the NSX is evident in its appearance and performance. Follow the beautiful lines of this automotive masterpiece while listening to the throaty rumble of its revolutionary hybrid engine. Feel the power and grace that envelops you while sitting in its minimalistic yet accommodating cockpit. 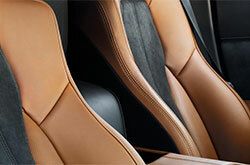 Experience all the attention to detail that inhibit every inch of this supercar. Although the NSX's roots are in Japan and Italy, the second generation NSX's were designed in the USA and are built in Ohio. 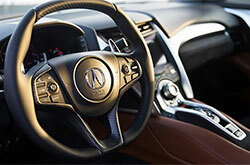 The NSX offers several dynamic modes of driving which are tailored settings depending on your driving preference. If you're coming home late and don't want to wake the neighbors with your powerful rumble, simply select "Quiet" and the NSX will operate on electric only for a nearly silent drive. For the enthusiast who needs to hear the engine, "Track" mode offers no filters to experience the true rumble of the NSX and its power. The NSX is generously equipped however for the owner who wants a little more, Acura offers several options which allow an owner to personalize their car. The 2018 Acura NSX is a true gamechanger. 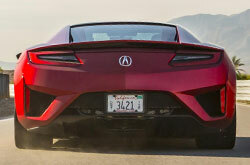 The team at Acura combined a 3.5L DOHC V-6 twin-turbocharged engine with a direct drive supercar electric motor. The result is an experience that will send a driver from 0-60 mph in 2.7 seconds and can smoothly transition through nine gears up to 191 mph. The two power plants combined generate an impressive 573 hp with 406 ft lbs of torque and all of the control you need to go along with it. Fuel economy for the NSX is impressive and thanks to its hybrid engine it can obtain 21 mpg in the city and 22 mpg on the hwy. Several engineering innovations were achieved in the reformulation of the NSX, one of which is Aluminium Ablation Castings. These contribute to optimal structural rigidity while providing excellent safety crash performance. Another innovation is the utilization of world-first, three-dimensional bent high strength steel tubing. This technology reduces blind spots for the driver while increasing strength to the A-pillars and roof rails. Traction and Handling is accomplished effectively with the Sport Handling All-Wheel Drive. And what's the point of having 573 hp if you can't stop? The NSX Super Sport brakes offer true fidelity when braking by utilizing both hydraulic and hybrid regenerative braking technologies seamlessly. 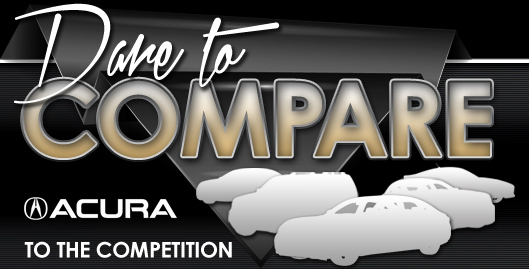 For more information, we invite you to our Acura dealership in Arlington, TX to speak with a member of our team or to take the NSX for a test drive! *Get Today's Price is available to all customers and can also be obtained by calling or coming into the dealership today. Purchase prices do not include tax, title, license and $150.00 doc fee. Prices include the listed incentives. Please verify all information. We are not responsible for typographical, technical, or misprint errors. Inventory is subject to prior sale. Contact us via phone or email for more details. *MPG Based on 2018 EPA mileage ratings. Use for comparison purposes only. Your mileage will vary depending on driving conditions, how you drive and maintain your vehicle, battery-pack age/condition, and other factors.